Very nice recent apartment, 3 stars. 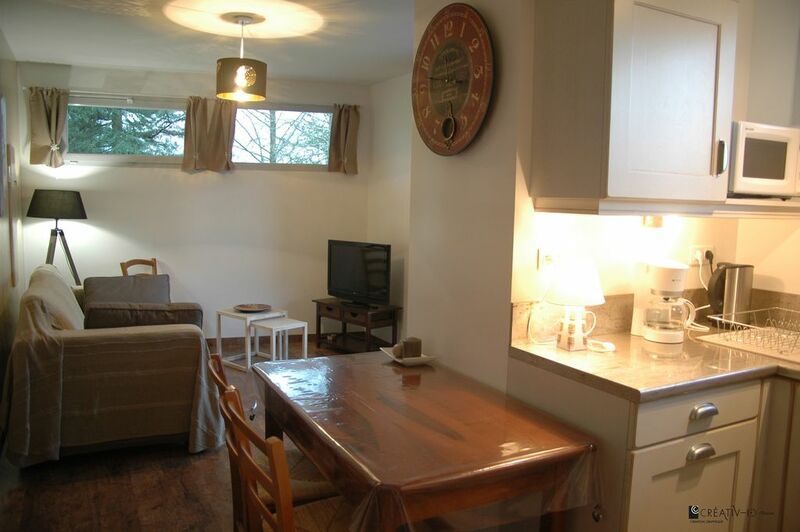 This apartment for 2 people consists of a living room with a fully equipped kitchen, with dishwasher, washer dryer, oven, hob 4 burners: 2 gas + 2 induction. A room equipped with a bed 160x200. A bathroom, walk-in shower, separate toilet with hand washing. Free broadband Wifi. Semi covered terrace and huge garden available 5000 m² well maintained. Garden furniture with a table 2 chairs 2 sun loungers and a barbecue. Recent construction. The apartment is located in our house, individual entrance, no vis-à-vis we are on site for the delivery of keys. - Bike shelter with individual and secure closure + external tap and water jet for bicycle washing. It is also possible to store skis, snowshoes sled sticks, fishing rods in this shelter, or any other object of leisure. You can enjoy our large garden, its stream. We are a little behind the village, which you can reach in 5 minutes on foot. Shops and services in the village: supermarket, pharmacy, restaurant, petrol station, garage, launderette. On Sunday morning, you can even make your market in the central square! We are reachable at any time on 05 59 34 63 59. - high season rate: the 7 nights at 350 € the months of July and August. Not being able to inform the decreasing price for the nights beyond 3 nights on the site we will try to propose them to you. Possibility nights according to availability: 3 nights or more. For the very low season week rate at 250 € for 7 nights: the nights are at 65 € from 3 nights or 195 €, for 4 nights: 220 €, for 5 nights 230 € for 6 nights: 240 €. For the low season week rate at 280 € for 7 nights: the nights are 70 € from 3 nights or 210 €, for 4 nights: 240 €, for 5 nights 260 € for 6 nights: 270 €. For the mid-season week rate at 300 € for 7 nights: the nights are at 76 € from 3 nights: 228 €, for 4 nights: 250 €, for 5 nights 270 € for 6 nights: 290 €. For the high season week rate at 350 € for 7 nights: the nights are at 83.33 € from 3 nights: 250 €, for 4 nights: 280 €, for 5 nights 310 € for 6 nights: 330 €. This period is proposed in nights during June otherwise it is blocked in the week from Saturday to Saturday. In winter you enter a heated apartment, then the heating is extra, from October 15 to April 30 included. Electricity will be charged upon departure after meter reading at 0.16 kwh less 8 kwh per night of occupancy. Electricity included from May 1st to October 14th. In the heart of Béarn and at the gates of the Basque Country we are located in the charming village of Aramits (600 inhabitants), on the road to Arette, 15 km from Oloron Sainte Marie and 50 km from Pau, at the foot of the ski resort of Pierre Saint Martin, for the practice of the ski of track and bottom. Spain is nearby at 30 km. • Winter: Downhill skiing, cross-country skiing and snowshoeing at Pierre Saint Martin (20 minutes) or Issarbe (25 minutes) at Somport and Iraty. PRACTICAL: A shuttle allows you to reach the Pierre Saint Martin every weekend and during the school holidays, 2 round trip / day. Good deal: on reservation, we lend you toboggans, TSL brand snowshoes and poles (small attention very appreciated by holidaymakers). Visit our site which will give you several tips to equip you best before your arrival and so practice quietly this very affordable sport. • Autumn: Shepherd's Day takes place on the third weekend of September. Important and diversified event that takes place over 4 days with the descent of herds, a "hearty" lottery, vocal meetings, the contest of the best cheese and finally the contest of the shepherds dogs. This party has been organized for over 30 years by volunteers. A deposit of 25% is required upon booking, with the contract signed. The balance can be paid on arrival as well as the deposit of 250 €, to also provide a certificate of insurance that covers the rental risks. Household fees are optional but 50 € are requested on arrival and returned at departure when the household is properly done. Precioso, cómodo y cuidado apartamento en una zona tranquila sin ruidos para descansar por la noche. Appartement très confortable, en excellent état, décoré avec goût, dans un environnement calme avec vue sur les montagnes. La propriétaire est accueillante et d'une grande gentillesse. Merci pour cette semaine "ressourçante" . Je vous remercie pour votre commentaire et je suis heureuse que vous gardiez un bon souvenir du séjour peu enneigé. Vous avez su accepter les conditions et tirer profit de ce que l'on pouvait vous offrir. Je pense que c'est une façon de réussir ses vacances. C'est avec plaisir que je vous recevrez à nouveau. Location très calme et très bien équipée. Merci à vous deux, c'est avec plaisir que je vous recevrez à nouveau. Propriétaire très agréable et de bon conseil. Aramits est idéalement placé dans le Piémont Pyrénéen propice à la randonnée (magnifiques paysages). La haute montagne est à proximité et l’Espagne également. In the heart of Béarn and at the gates of the Basque Country we are located in the charming village of Aramits (600 inhabitants), 15 km from Oloron Sainte Marie and 50 km from Pau, at the foot of the ski resort of La Pierre Saint-Martin. Spain is close to 30 km. Good deal: on reservation, we lend you toboggans, snowshoes and sticks! • Summer: walks, hiking, cycling, tree climbing, canyoning, municipal swimming pool 5 km, paragliding, fishing, caving, pastoralism.